UPDATED: Sun., Feb. 10, 2019, 11:14 a.m.
Spokane will likely see another 2 to 3 inches of snow today amid calmer winds, and another spurt of snow is expected late tonight for Monday morning. Spokane woke up Saturday to 4 to 7 inches of fresh snow, a few power outages, quite a few car crashes and some road closures including part of Interstate 90 near Kittitas. “We’re just kind of in the pattern where we’re getting a lot of precipitation, but there’s just no warm air with it,” said Joey Clevenger, meteorologist at the Spokane branch of the National Weather Service. Winds are forecast to die down today, so snowdrifts won’t be much of a concern, Clevenger said, and the high temperature today will be in the teens to low 20s. 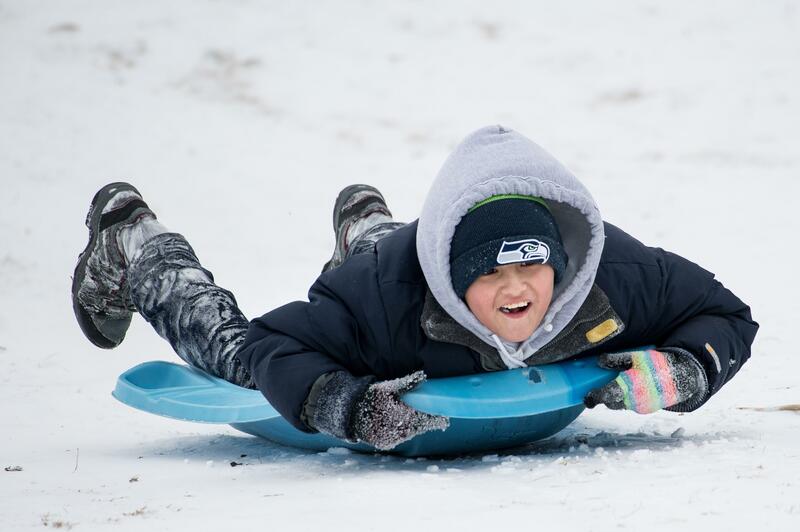 Between 4 and 7 inches of snow hit Spokane on Friday night, depending on the area, he said. Check the most recent forecast here. On Saturday morning, winds blew at 20 to 25 miles per hour, with gusts up to 35 mph, Clevenger said. Winds will be increasing in the Spokane area into the night with gusts up to 40 mph, but then dropping after nightfall. “The blowing snow is creating hazardous driving conditions,” he said. Some roads and highways in Eastern Washington were shut down because of snow drifts, spin-outs and low visibility. Interstate 90 is closed between Kittitas and Vantage. Interstate 82 is closed from Coffin Road to the Oregon border. State Route 27 is closed going both ways between Tekoa to Fairfield in Whitman and Spokane Counties. U.S. Highway 2 is closed near Waterville, four miles west of Coulee City. State Route 172 is closed from Highway 2 to Mansfield. Get the latest traffic information here. Clevenger said the temperature on Saturday was forecast to peak at 19 degrees, with an inch of new snow during the day. Interstate 90 in or near downtown Spokane saw more than 10 crashes from 6 a.m. to 9 a.m.
“We’ve had so many I couldn’t count them all,” said a Washington State Patrol dispatcher. Several flights coming into Spokane were canceled from cities including Seattle, Portland and Boise. A fallen tree in north Spokane hit power lines at about 6:11 a.m., causing power loss for 240 customers, according to Avista. Another 142 customers also lost power in the downtown area. Winds caused tree trunks and branches to snap, and in a few cases, houses were damaged. A tree in Sandpoint crashed into a house, but no injuries were reported, and in Spokane Valley, a 10-year-old boy suffered minor injuries when multiple trees fell through a house, according to KHQ. City and county crews are working on a full-city plow, which was announced Friday. More than 70 pieces of plowing equipment are being used, and the city is asking drivers to park on the odd side of the street. Check the live-updated map of plowed streets here. All the local ski resorts remain open: Mt. Spokane, Silver Mountain, 49 Degrees North, Schweitzer and Lookout Pass all report new snow. The city of Yakima declared a state of emergency Saturday because of the snow and wind. Published: Feb. 9, 2019, 10:11 a.m. Updated: Feb. 10, 2019, 11:14 a.m.